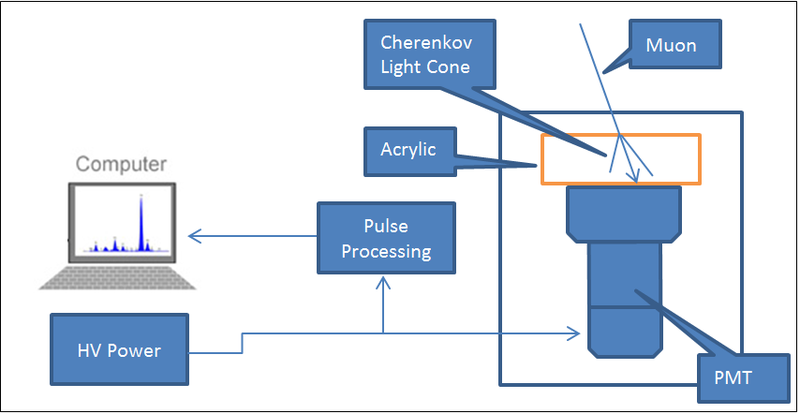 In this post we propose the construction of a cosmic rays Cherenkov detector based on a radiator made of a transparent acrylic plastic block. 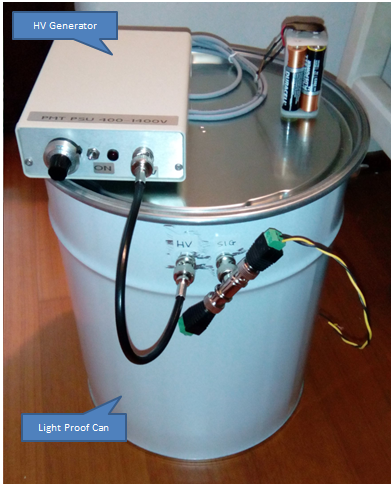 In this site we have already described a water Cherenkov detector, in which the radiating material was formed by the water contained in a dewar vessel. For the Cherenkov radiation theory we refer to the post above, while here we are focused in the description of the new detector and its use for the detection of cosmic muons. 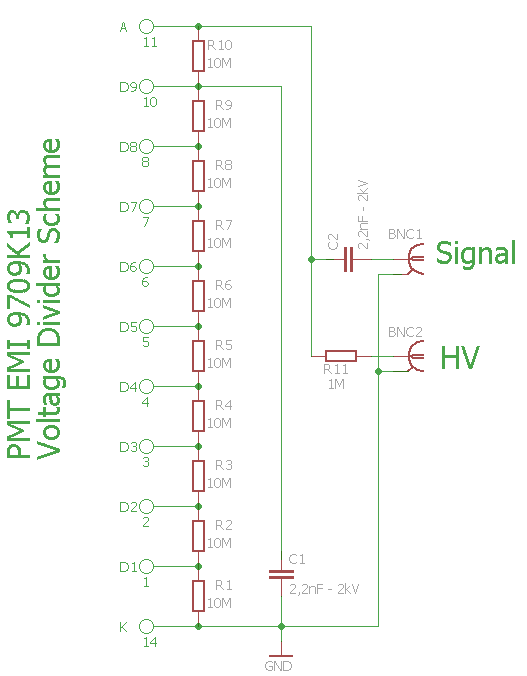 For the realization of the detector we used a photomultiplier EMI 9709KB, characterized by a large photocathode of 130mm, thus able to cover a rather large area. In the side image we can see the PMT mounted on a wooden stand. This was done so as to set up upward the PMT photocathode. Above the photocathode it is placed the block of acrylic plastic. In order to adhere well the acrylic plastic surface with the PMT glass surface a optical silicone grease was used which has the function to optimize the optical coupling of the two surfaces and minimize internal reflections. The silicone grease should be placed on the glass of the PMT and distributed evenly, then you place the acrylic block and move it gently so that the grease is evenly distributed between the two surfaces : you must avoid the presence of air bubbles or accumulations and this it can be easily verified through the upper face of the acrylic crystal. In the image aside we see the PMT positioned within a light-tight container. 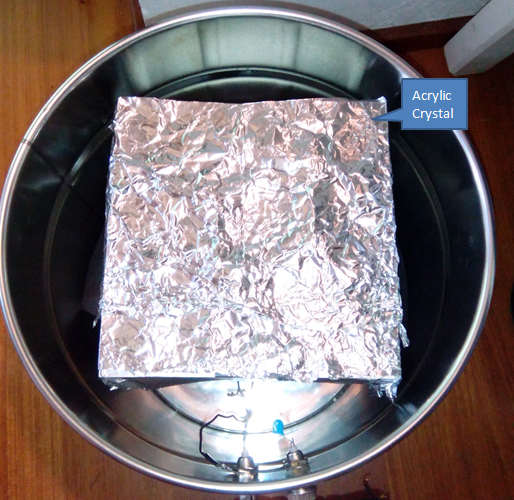 The acrylic crystal was then wrapped in a reflective aluminum foil in order to increase the detection efficiency. The Cherenkov radiation is rather weak and therefore it is important to maximize the detector light gathering ability. In the picture below you can see the final equipment with the PMT and the acrylic plastic radiator wrapped in aluminum foil. 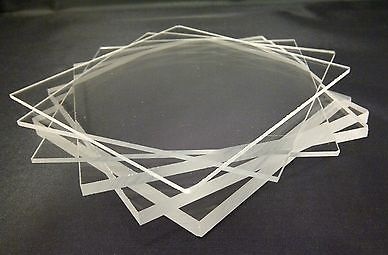 The cosmic muons, being characterized by relativistic speeds, when crossing the acrylic plastic crystal they give rise to the generation of a flash of Cherenkov radiation. The crystal has a thickness of 50mm and the number of photons generated in the passage of a muon with high energy (1GeV) is estimated to be a few hundred. 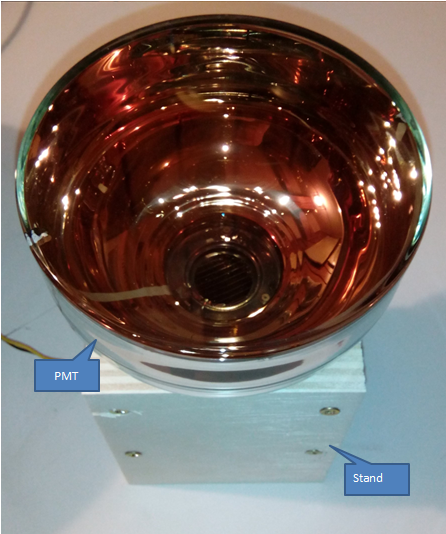 The acrylic crystal is placed above the photocathode of the PMT so, since the Cherenkov radiation is directed in the same direction of the muon, the photocathode of the PMT is reached by the photons generated by cosmic muons that have vertical direction (they are the majority). The diagram below illustrates the experimental setup . 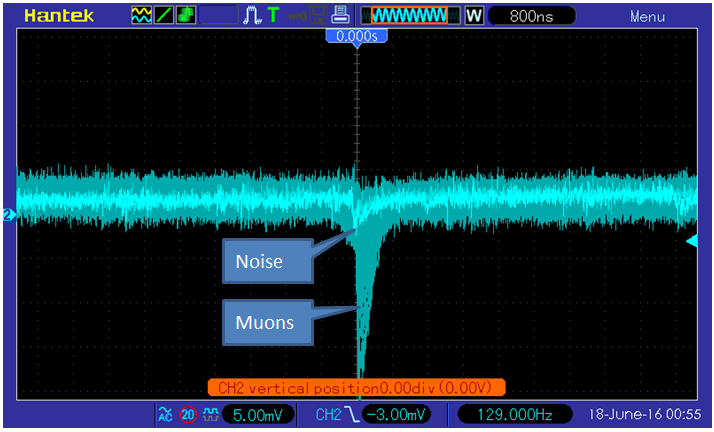 In the image below, we see a series of Cherenkov pulses acquired by the oscilloscope with a load resistance of 1kΩ. 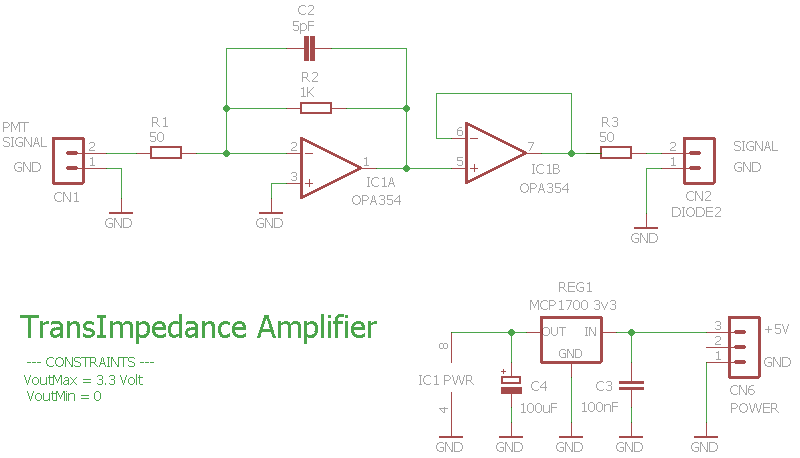 The pulses have an amplitude ranging from 20mV to 50mV and have a frequency of about 1Hz (1 cps). With a lower frequency rate there are also pulses of greater amplitude, as seen in the image below. 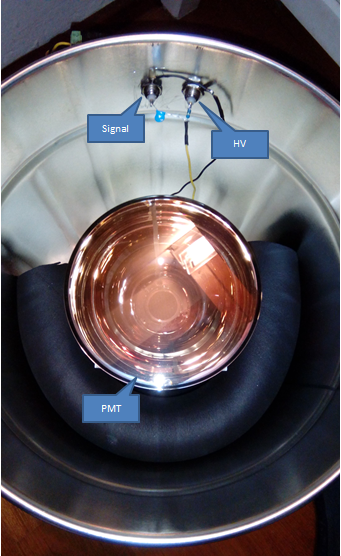 The spurious pulses (noise) generated by the PMT have lower amplitude, below 10mV, so placing the detection threshold at 20mV, we select easily only the pulses due to Cherenkov radiation generated by the passage of cosmic muons through the acrylic plastic crystal. In the image below, captured with an oscilloscope, the pulses due to noise with the ones due to Cherenkov radiation are compared. 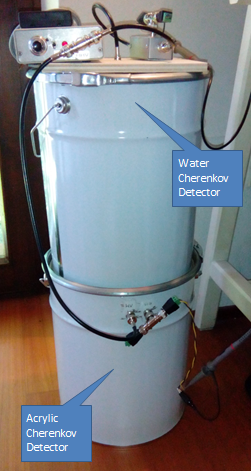 Using the water Cherenkov detector already described in the post water Cherenkov detector together with the acrylic crystal detector it is possible to make measurements of cosmic muons using the coincidence between the signals generated by the two detectors. 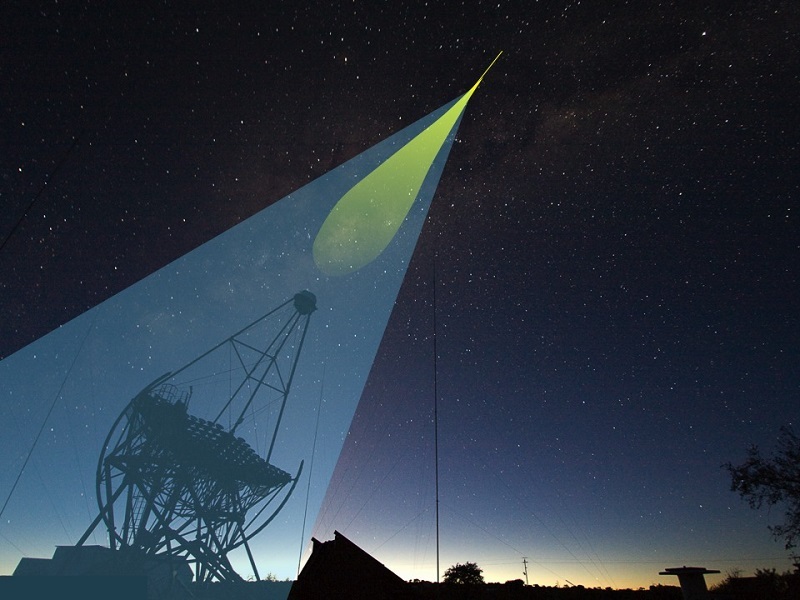 The two detectors are positioned vertically one above the other as shown in the diagram aside. The upper one is the water detector, while the lower is the detector that uses the acrylic crystal . Both are powered by the same PMT HV generator set to 1400V. A muon with enough energy and vertical direction, easily generates Cherenkov radiation both in the first and in the second detector. 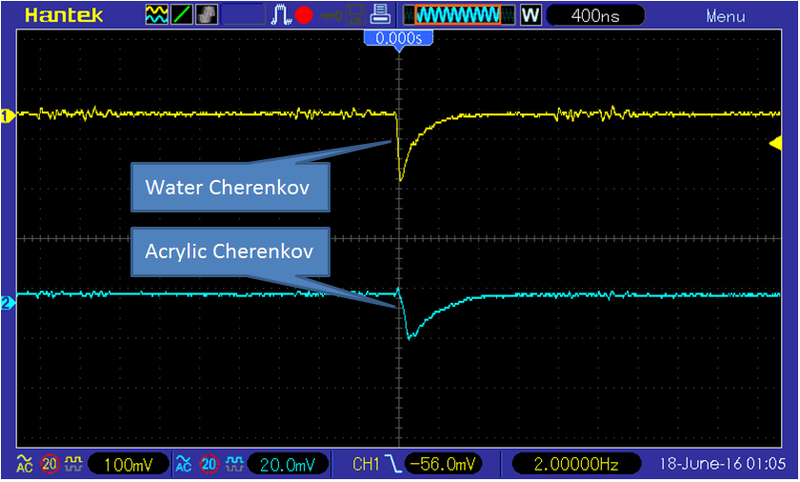 Of course the rate of events is quite low, a few dozen per minute, in the image below you can see an example of two Cherenkov pulses, they originated from the two detectors : the yellow line corresponds to the water detector, while the blue one to the acrylic detector .